Why should cookies get all the glory during the holiday season? Christmas is also the perfect time to try out some new cake-decorating techniques. These inspirational ideas will impress your holiday guests and bring a little holly jolly spirit to your dessert table. This lovely dessert will work for Christmas or any other winter holiday with just a few modifications. The design looks impressively complicated, but don’t despair—it’s easier than it appears. A festive gingerbread cake would taste delicious as the base, but you can use any cake flavor that strikes your fancy. There’s no time like the present to try this beautiful wrapped-up cake. Adjust the colors to match the wrapping under your tree or use classic red and green for the season. If you really want to go all out, make a few smaller cakes to wrap up for a celebratory pile of "presents." No one will be able to resist tearing into this pretty package. Have an ugly Christmas sweater party to attend? Bring this beautiful fondant-draped cake to match the theme! The recipe is made in a sweater-shaped pan, but you can easily cut one out from a 9-by-13 cake or several round cakes. The kids will love finishing up the scraps. Peppermint and chocolate are a classic combination and this cake really, well, takes the cake! The buttercream filling contains crushed candy pieces, which add both a delicious flavor and a satisfying crunch. To decorate, sprinkle crushed peppermints on top and ring with miniature candy canes for a festive twist. The kids can help stick the candy canes on and adults will love the flavor combination. If you want to make it ahead, use Andes or similar candies instead of hard candies; they'll get a little mushy after a day or so. For a handy guide to making a beautiful wreath for your Christmas dessert table, look no further than this recipe, which walks you through the all the necessary steps. It even includes a recipe for royal icing, so you really can’t go wrong. Use any flavor of cake you prefer, but white icing makes the decorations really pop. 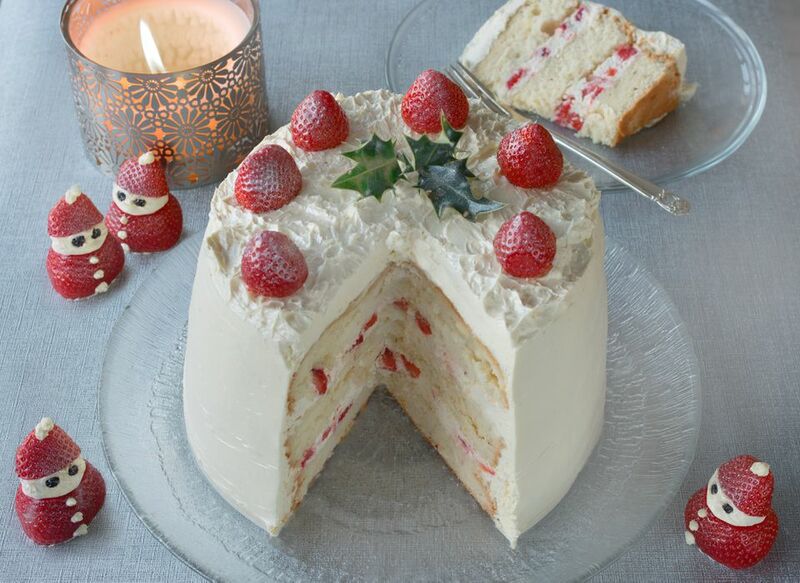 ​This beautiful Japanese cake featuresstrawberries in fluffy whipped cream, all surrounded by a light, airy sponge. It's a less dense cake than the usual Christmas confections, so it'd make an excellent addition to your holiday dessert table. Decorate it with more fresh berries, a sprinkling of sugar, and some fresh holly leaves. Remember that holly isn't edible, so consider removing it before eating to be safe. You’ll be singing “O Christmas tree” to this gorgeous and simple cake that you can match with your decorations. It's recommended to partially freeze the cake to make it easier to cut it into the tree shape, so plan ahead accordingly. Feel free to use your favorite cake flavor to offset the royal icing. This impressive buche de Noel or Yule log cake is a traditional French holiday dessert that translates wonderfully wherever you live. Mocha frosting makes this recipe extra special, but plain chocolate works well, too. Best of all, the icing covers up any cracks that may happen when you roll the cake. What’s more classic than a candy-studded gingerbread house? With this step-by-step guide, you can make a beautiful gingerbread house from scratch that will act as both a centerpiece and a delightful holiday dessert. Get the kids in on the fun to make Christmas memories and sweet treats. 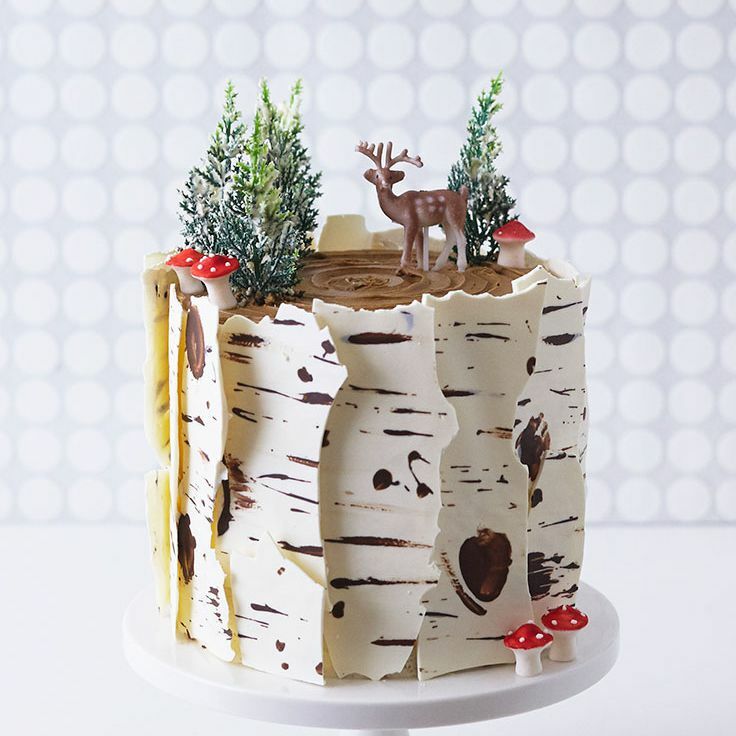 Serve this friendly reindeer cake at a kids’ Christmas party or for adults with a sense of whimsy. The tutorial includes a printable pattern for the antlers, so you’ll have dessert taken care of in no time. Chocolate or yellow cake would taste great in the simple layer recipe. Wait until you see the colorful layers inside this eggnog cake draped with festive fondant. This sky-high recipe takes some effort, but once you cut into it, it’s all worth it. The moist layers and eggnog icing taste delicious together, but feel free to use plain buttercream too.